Aimed at the trail and all-mountain segments, Five Ten's clipless Kestrel shoe is characterized by a hike-friendly outsole, a stiff shank for pedaling efficiency and a slimmer profile than most flat pedal shoes. Some might call it an enduro shoe, but I'll just say it's for mountain biking. 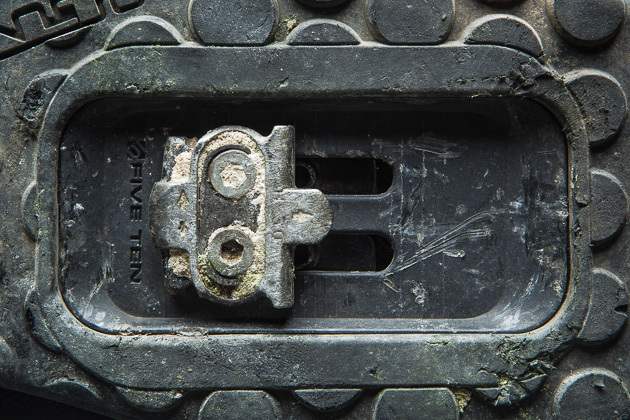 Five Ten's specialty is rubber, and the Kestrel's outsole is a twofer of the company's C4 and Mi6 Stealth compounds. The former is a harder rubber used in the pedal contact area to increase power transfer, while the softer Mi6 used in the heel and toe is intended to improve walking traction. At 403 grams each (size 9), this is the lightest and stiffest shoe in Five Ten's clipless lineup. Closure is handled by a single Boa dial, which turns clockwise to tighten and pops out to fully loosen. 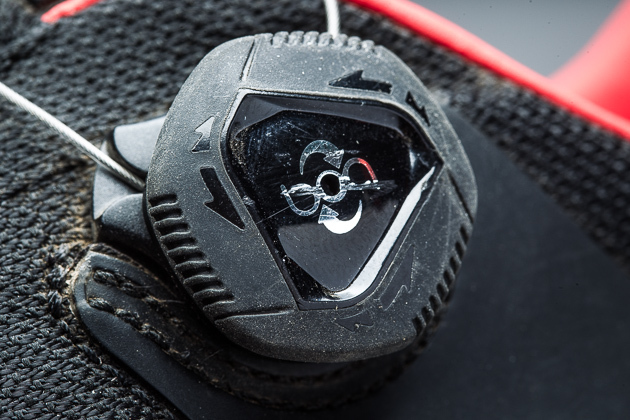 The dial also allows a handful of counter-clockwise loosening clicks, which are handy for making fine adjustments when your feet swell after a couple hours of pedal pushing. Power transfer seems exemplary, as it should given the carbon-infused shank. I mated the Kestrels to a pair of HT X1 pedals (review coming soon), and Five Ten's rubber gripped nicely when I had to rely on the X1s' pins for traction, which isn't to suggest I had trouble clipping in with the Kestrels. 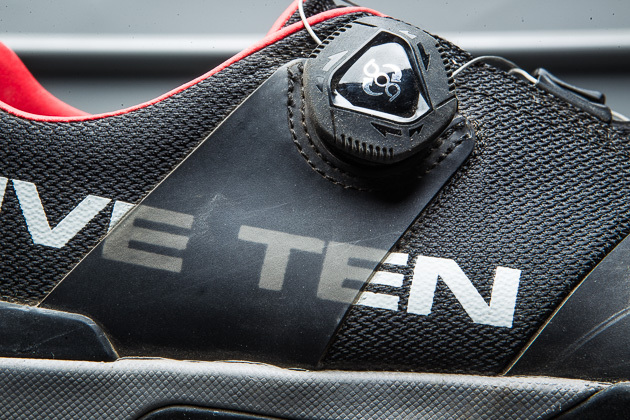 Five Ten has struck a nice balance in this respect–the less-grippy C4 rubber used around the cleat allows for easy pedal engagement, but also provides decent grip when necessary. The Mi6 in the toe and heel provided ample traction when I had to hoof it on our loose and rocky Southern California trails, and I was thankful for the rubber-capped toe, which fortified my digits from rock strikes. The bellows tongue keeps debris out of the shoes, and I thankfully didn't have any issues with it migrating to either side of my ankle. When it comes to fit, the Kestrels seem to run a bit large. I typically wear a size 10 or 10.5 (43.5 or 44 euro), but the pair of 9.5's (42.5 euro) that I've been riding fit me spot-on. That being said, I do have a fairly low-volume foot. Now, here's my gripe with the Kestrels: the Boa does not evenly tighten the shoe, pulling in a disproportionate amount of tension across the upper part of the tongue, but leaving the cable relatively slack over the forefoot. This is probably less problematic for fatter-footed folks, but I occasionally struggled to find a happy medium between the shoes being too tight around the base of my ankles or too loose around my forefeet. Otherwise, I found the Kestrels to be good and comfy on the bike. There wasn't any annoying rubbing and there weren't any awkward seams. The mesh upper breathes really well, and the shoes seemed to shed water nicely, though I didn't have an opportunity to test them in any truly sloppy conditions. As far as durability goes, the upper is well-enough protected that I wouldn't worry about any ripping, and the overall construction is solid, as I've come to expect from Five Ten. Surprisingly, the outsole is my primary cause for concern, as it's showing wear in the spots where the pins on my pedals have torn into the rubber. 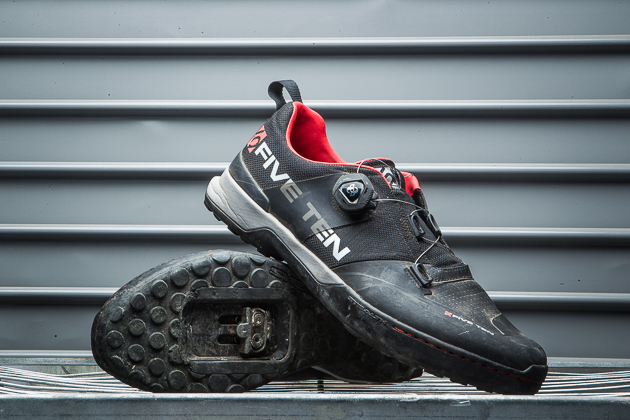 Five Ten has struck a fine balance between weight, protection and off-the-bike performance that will please most riders, especially those looking to get out of plastic-lugged XC slippers or clunky skate-style downhill kicks. They’ll cost $180 smackaroos, which is right in line with other shoes in this class. I recommend trying them on before you throw down, though, just to be sure that the sizing and the Boa work for your feet. They'd be great shoes to run in combination with a non-pinned platform pedal like Shimano's XT Trail, but be aware that a pinned platform may tear away at the outsole. The Kestrels will be available in April and they’ll run the full gamut of sizes from 5-13 US.